This chapter explores some implications of the emerging telecommunications networks for urban areas and concludes that new networks will do more to support metropolitan governance than to reinforce localism within traditional city and suburban municipal boundaries. 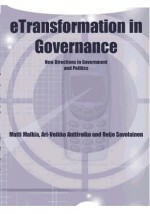 Employing U.S. telecommunications policy as its setting, the chapter proposes creation of metropolitan nongovernmental organizations for urban regions to undertake telecommunications policy roles that currently are unaddressed. The proposed Metropolitan Telecommunications Organization (MTO) would represent urbanized areas interests in guiding the build-out of the new public network; in designing the metropolitan telecommunications system, in providing network security, in insuring open access and universal service, and in undertaking other important system governance roles that currently are not being addressed by local governments. In the U.S., MTOs would be an advocate for the values of community in society, including promoting digital democracy, community access centers, metropolitan telecommunications tax equity, and support for community institutions.